, the Huffington Post vertical focused on causes and donations, has come under fire by the Nieman Journalism Lab, which is questioning its relationship its partner, Causecast. According to Nieman Journalism Lab, the section’s content is outsourced to the for-profit firm that has nonprofit clients. Causecast gets a platform to promote its services and the nonprofits it chooses to highlight, some of which are its partner organisations. Meawhile, HuffPost shares advertising and sponsorship revenues the section generates with Causecast. 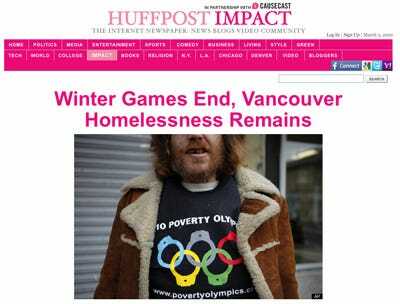 At face value, the partnership between Huffington Post and Causecast seems like a good idea. Online ad sales continue to plummet as advertisers realise that traditional banner ads don’t work like they thought they did. But the lack of transparency about who is writing the post makes the deal a little shadier than it first seems. According to Nieman, there has been at least one instance where one of the Causecast/Huff Post writers posted a story about one of their organisations. In a post about the nonprofit Malaria No More, there was no disclaimer highlighting the relationship between the two groups — despite the fact that there was a Causecast widget at the end of the story for readers to donate to the nonprofit. HuffPost Impact was created to spotlight the kinds of stories that don’t often get prominent coverage: service, causes, volunteering, and giving back. The editorial process for Impact is the same as the one for all of HuffPost’s verticals, with the section’s editors overseen and guided by senior HuffPost editors. Impact does not offer paid editorial placements, either in terms of story selection or the inclusion of links. Advertisers interested in cause-related marketing are limited to placing ads on the Impact section, or through sponsorships that are clearly marked as such. Incidentally, HuffPost Impact editor Victoria Fine wrote today that she is leaving to pursue stories in Iraq and South Africa.